Plantin is an old-style serif typeface named after the sixteenth-century printer Christophe Plantin. It was created in 1913 by the British Monotype Corporation for their hot metal typesetting system, and is loosely based on a Gros Cicero face cut in the 16th century by Robert Granjon and held in the collection of the Plantin-Moretus Museum of Antwerp. The intention behind the design of Plantin was to create a font with thicker letterforms than were often used at the time: previous type designers had reduced the weight of their fonts to make up for the effect of ink spread or to achieve a more elegant image, but by 1913 innovations in smoothing and coating paper had led to reduced ink spread. In preparing the design Monotype engineering manager Frank Hinman Pierpont visited the Plantin-Moretus Museum, which provided him with a printed specimen. Plantin was one of the first Monotype Corporation revivals that was not simply a copy of a typeface already popular in British printing; it has proved popular since its release and has been digitised. It can in retrospect be seen to have paved the way for the many Monotype revivals of classic typefaces that followed in the 1920s and 30s. Plantin would later also be used as one of the main models for the creation of Times New Roman in the 1930s. The Plantin family includes regular, light and bold weights, along with corresponding italics. Steel punches, the masters used to stamp matrices used to cast metal type, at the Plantin-Moretus Museum. Its unique collection of original sixteenth-century matrices and punches inspired the Plantin design. Cases of type at the Plantin-Moretus Museum. Plantin was designed and engraved into metal at the Monotype factory in Salfords, Surrey, which was led by Pierpont and draughtsman Fritz Stelzer. Both were recruits to Monotype from the German printing industry. The choice to revive a French renaissance design was unusual for the time, since most British fine printers of the period preferred either Caslon or revivals of the fifteenth-century style of Nicolas Jenson (recognisable from the tilted 'e'), following the lead of William Morris's Golden Type, both of which Monotype would also develop revivals of. However, other revivals of Aldine/French renaissance typefaces followed from several hot metal typesetting companies in the following decades, including Monotype's own Poliphilus, Bembo and Garamond, Linotype's Granjon and Estienne and others, becoming very popular in book printing for body text. Miller & Richard's Old Style, a delicate reinterpretation of pre nineteenth-century printing styles that became popular in the late nineteenth century. While offering a version of it as one of their first faces, Monotype in creating Plantin aimed to offer a more solid design that would print clearly. The design for Plantin preserved the large x-height of Granjon's designs, but shortened the ascenders and descenders and enlarged the counters of the lowercase 'a' and 'e'. Not all the letters were Granjon's: the letters 'J', 'U' and 'W', not used in French in the sixteenth century, were not his, and a different 'a' in an eighteenth-century style had been substituted into the font by the time the specimen sheet was printed. A digitisation of Times New Roman below Plantin and two other typefaces originally considered as a basis for the Times project: Perpetua, Baskerville and Plantin. Times is most based on Plantin, but with the letters made taller and its appearance "modernised" by adding eighteenth- and nineteenth-century influences similar to Baskerville and Perpetua, in particular enhancing the stroke contrast. A sample image of Plantin created by Fontshop, showing infant styles and the condensed "News" and "Headline" styles sold for newspapers. With its relatively robust, solid design compared to the Didone and "Modernised Old Style" faces popular in the early twentieth century (which Monotype already had made versions of), Plantin proved popular and was often particularly used by trade and newspaper printers using poor-quality paper in the metal type period and beyond. [c] As the basic font is relatively dark on the page, Monotype offered a 'light' version as well as a bold, which Williamson describes as "particularly suitable for bookwork." During the interwar period the face was adopted and popularized by Francis Meynell's Pelican Press and by C. W. Hobson's Cloister press, and also used occasionally by Cambridge University Press. A custom version, "Nonesuch Plantin" was also cut for Meynell's Nonesuch Press, one of the first fine printers to use Monotype machines, with extended ascenders and descenders on the lower-case. Type designer Walter Tracy noted that this changed the type's appearance to a surprising extent: "it look[s] not only more refined but as if it derived from another period: Fournier's, say [in the eighteenth century], not Granjon's." It was appropriately used by the Bodley Head to print Meynell's autobiography. Monotype also created a condensed version, News Plantin, for The Observer in the late 1970s. An infant variety of the typeface also exists, with single-story versions of the letters 'a' and 'g' and a 'y' with two straight sides. The font was used as the signature font for ABC News from 1978 until 1999. In more recent usage, the magazine Monocle is set entirely in Plantin and Helvetica. Plantin was the basis for the general layout of Monotype's most successful typeface of all, Times New Roman. Times is similar to Plantin but "sharpened" or "modernised", with increased contrast (particularly resembling designs from the eighteenth and nineteenth century) and greater "sparkle". Allan Haley commented that Times New Roman "looks like Plantin on a diet." ^ a b c d e Slinn, Judy; Carter, Sebastian; Southall, Richard. History of the Monotype Corporation. pp. 202–3 etc. ^ Schuster, Brigitte (2010). "Monotype Plantin: A Digital Revival by Brigitte Schuster" (PDF). Royal Academy of Art, The Hague (M.A. thesis). Retrieved 23 May 2014. ^ a b Carter, Sebastian (1995), Twentieth Century Type Designers, W. W. Norton & Company, pp. 28–29 . ^ a b c d Morison, Stanley (7 June 1973). A Tally of Types. CUP Archive. pp. 22–24. ISBN 978-0-521-09786-4. ^ Meggs, Philip B.; Carter, Rob (1993), "29. Plantin", Typographic Specimens: The Great Typefaces, John Wiley and Sons, pp. 302–311, ISBN 978-0-471-28429-1 . ^ Dreyfus, John (1995). Into Print: Selected Writings on Printing History, Typography and Book Production (1st hardcover ed.). Boston: David R. Godine. pp. 116–124. ISBN 9781567920451. ^ Mann, Meredith. "Where Did Times New Roman Come From?". New York Public Library. Retrieved 2 February 2016. ^ Mosley, James (2003). "Reviving the Classics: Matthew Carter and the Interpretation of Historical Models". In Mosley, James; Re, Margaret; Drucker, Johanna; Carter, Matthew (eds.). Typographically Speaking: The Art of Matthew Carter. Princeton Architectural Press. pp. 31–34. ISBN 9781568984278. 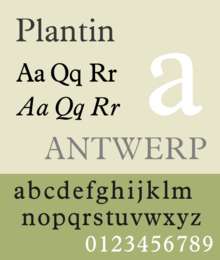 Plantin was a recreation of one of the old types held at the Plantin-Moretus Museum in Antwerp, of which a specimen, printed in 1905, had been acquired by Pierpont on a visit. The type from which the specimen was printed was not only centuries old and worn almost beyond use, but it was contaminated with wrong-font letters (notably the letter ‘a’) and the italic did not even belong to the roman. The revival, derived by Monotype from an indirect and confused original, is as sound a piece of type-making as was ever created in the 20th century…behind the foggy image of the roman type lies the...'Gros Cicero' Roman of Robert Granjon, acquired by the Plantin printing office after the death of its founder. ^ a b Mosley, James. "Comments on Typophile thread". Typophile. Retrieved 16 December 2016. The consensus appears to be that not only the wrong-fount a in the cases at Antwerp but also the italic that Monotype adapted for their Plantin (which can be seen on that first page of the 1905 specimen) may be the work of Johann Michael Schmidt (died 1750), also known as J. M. Smit or Smid. ^ Lamesle, Claude (1742). Épreuves générales des caracteres. p. 55. ^ Lamesle, Claude (1742). Épreuves générales des caracteres. ^ "Monotype (advert)". Modern Publicity: 187. 1930. Retrieved 15 March 2017. ^ Warde, Beatrice (1932). "Twenty Years of Advertising Typography". Advertiser's Weekly: 130. Retrieved 15 March 2017. ^ Hackney, Fiona Anne Seaton. ""They Opened Up a Whole New World": Feminine Modernity and the Feminine Imagination in Women's Magazines, 1919-1939" (PDF). Goldsmith's College (PhD thesis). Retrieved 15 March 2017. ^ Lucy Lethbridge (14 March 2013). Servants: A Downstairs View of Twentieth-century Britain. A&C Black. pp. 187–8. ISBN 978-1-4088-3407-7. ^ Williamson, Hugh. Methods of Book Design. Oxford University Press. p. 81. ^ Steeves, Andrew. "Poetry Books for the Trala". Gaspereau Press. Retrieved 12 March 2017. ^ Tracy, Walter. Letters of Credit. pp. 50–1. ^ Joseph Rosenblum (1995). A Bibliographic History of the Book: An Annotated Guide to the Literature. Scarecrow Press. pp. 407–8. ISBN 978-0-8108-3009-7. ^ Luna, Paul (1986). "Small Print". Designer. The first national to install a Lasercomp, it overcame the lack of suitable text faces by commissioning its own, a slightly condensed version of Plantin. ^ Coles, Stephen (February 13, 2009). "In Use: Plantin for Monocle". The FontFeed. FSI FontShop International. Retrieved 2009-12-23. ^ Hutt, Allen (1970). "Times Roman: a re-assessment". Journal of Typographic Research. 4 (3): 259–270. Retrieved 5 March 2017. ^ Lawson, Alexander (1990). Anatomy of a Typeface. New York: David R. Godine. pp. 270–294. ISBN 9780879233334. Retrieved 6 March 2016. ^ Haley, Allen (1990). ABC's of type. Watson-Guptill Publications. p. 86. ISBN 9780823000531. ^ It has been reported that Plantin himself had used a few letters of the font to supplement another font, a Garamond, but Vervliet (2008) suggests that these may have been a set of slightly different custom sorts cut by Granjon. ^ A better-quality digitisation of the whole specimen is available but it does not include this leaf. ^ Monotype and its publicist Beatrice Warde particularly emphasised its popularity with advertisers, including the "Mrs Rawlins" series of adverts for washing starch.